Pokémon Sun and Moon are just days away from being released, but The Pokémon Company is still trickling out videos, teasing new details and revealing more attacks. In the latest video, The Pokémon Company gives us our first look at the special Z-moves that will be exclusive to the three starter Pokémon. Z-moves are a new feature being introduced with Sun and Moon and are essentially powerful attacks that can only be used once in battle, as long as the trainer has the proper item to use it. There have been a couple of Z-moves announced already, but these three powerful attacks can only be used with Decidueye, Primarina and Inceneroar — the final evolved forms of Rowlett, Litten and Popplio. Decidueye’s special Z-move, “Sinister Arrow Raid,” allows the Pokémon to soar high into the sky and surround itself with a cavalcade of arrows. It then barrels down back to its opponent and launches a devastating attack. Inceneroar’s exclusive move, “Malicious Moonsault,” will appeal to wrestling fans. In preparation for its attack, a wrestling ring is erected around its opponent, followed by Inceneroar turning into a ball of explosive firepower and executing a fatal body slam. 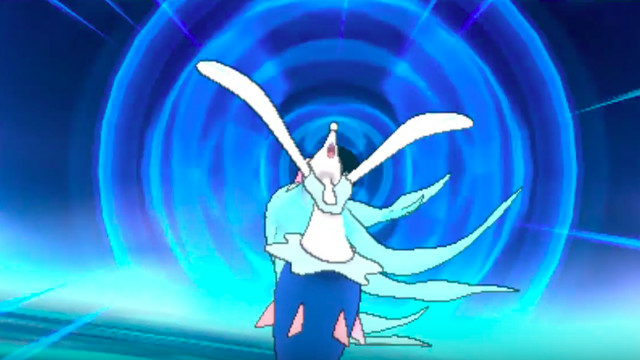 The last special Z-move, “Oceanic Operetta,” belongs to Primarina and features one of the better cinematic productions. Using its powerful voice, Primarina conjures up a giant ball of water and guides it over to its opponent, letting it sit above their head. When the trainer gives the sign, Primarina unleashes a powerful note at the top of its lungs, causing the giant ball to break and a torrent of water to fall over its opponent. The best part about the move, however, is the little bow the graceful Primarina takes at the end. The first Ultra Beast introduced is UB-03, now known as Lighting. It’s a fiery, electrical tree monster that appears to deliver a massive surge of electrical shock to its opponent in battle. UB-05, or Glutton, is a monstrous, warped-looking crab with claws sticking out of places claws should not stick out of. It’s as strong as it is intimidating and unleashes a powerful blow once its fully charged and ready to go. Pokémon Sun and Moon will be released for the Nintendo 3DS on Nov. 18.